Quarterback Colt McCoy threw his first interception of the year and the Browns special teams unit looked uneasy, as the Browns fell to the Philadelphia Eagles, 24-14. It was a by far the most disappointing performance by the Browns this preseason, but the score wasn’t indicative of the play on the field. A few costly penalties prevented the Browns from even scoring in the 1st half, as the Eagles took a 17-0 lead heading into halftime. WR Brian Robiskie, who had 3 catches for 23 yards, caught a beautiful 46-yard pass from McCoy that had the Browns inside the Eagles 5-yard line. The play was called back for offensive pass-interference, however, and the Browns ultimately had to punt. With time winding down in the 2nd Quarter, MLB D’Qwell Jackson leveled Eagles QB, Michael Vick, that led to an interception by Browns safety, Mike Adams. That play, too, was called back due to a phantom roughing the passer call. The Eagles then scored a few plays later on a 8-yard scamper from Vick. On offense, the Browns starting line looked sloppy for the second week in a row. The Eagles’ “Dream Defense” pressured McCoy all night, sacking him a total of 3 times. Although he kept his cool in the pocket, McCoy’s first interception of the preseason came when the Eagles pressured him up the middle causing the Browns quarterback to scramble out of the pocket. Eagles corner Asante Samuel broke on the ball and picked off McCoy’s pass intended for WR Brian Robiskie. The Eagles scored a few plays later on a 37-yard field goal by kicker Alex Henry. McCoy finished the game 9 of 18 passing, for 89 yards and an interception – easily his worst game of the preseason. Running back Montario Hardesty made his much anticipated debut last night, rushing 5 times for 15 yards. Aside from his first run of the game, Hardesty ran the ball well. His surgically repaired knee didn’t seem to bother him at all and finished off his runs by driving forward after contact. Head coach Pat Shurmur limited Hardesty’s action, but it had to be encouraging for Browns fans to see the former Tennessee Volunteer back in action after a year away from the game. With fellow RB Brandon Jackson out for an indefinite amount of time with a toe injury, Hardesty will be relied on heavily to spell starter Peyton Hillis. Cleveland’s special teams looked down right awful last night, which was a bit of a surprise as the Browns have sported one of the top special teams units in the NFL for the past few seasons. On their second possession of the game, the Browns FG unit allowed Eagles DB Dominique Rogers-Cromartie through the line, allowing him to block K Phil Dawson’s field goal attempt. The Eagles first score came on a muffed punt by Browns return-man Jordan Norwood. After calling for a fair-catch and an attempt to avoid the ball, he tripped over teammate Sheldon Brown. The ball then bounced off of Norwood’s back, resulting in a fumble in which the Eagles recovered. Newly acquired running back, Ronnie Brown, then scored on a 13-yard run two plays later. Norwood wasn’t the only one returning punts that had problems holding onto the ball. James Dockery also muffed a punt late in the game. The lone bright spot for the Browns special team unit, was easily first-year punter Richmond McGee. McGee was brought in by the Browns front office after regular starter Reggie Hodges was lost for the year with a torn ACL. The rookie punter has punted the ball well for the Browns so far this preseason. In last night’s game, McGee punted 5 times for 230 yards. He averaged 46-yards per punt, with a long of 54 yards and one punt downed inside the 20 yard line. 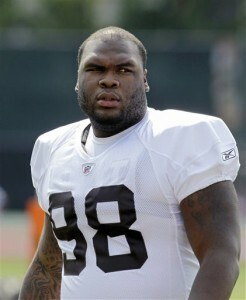 The player of the game for the Browns was easily rookie DT Phil Taylor. Taylor, who was the Browns 1st Rd. pick in this year’s draft, absolutely dominated the line of scrimmage against the Eagles vulnerable offensive line, and had a sack on Eagles’ QB Michael Vick that resulted in a fumble – the Browns 5th forced fumble of the preseason. Often thought of as a pure run stopper, Taylor displayed an arsenal of pass-rush moves and was in Vick’s face non-stop during the first half. If Taylor can develop his game as a pass and run stuffer, the Browns will be set on the defensive line. DE Jayme Mitchell, DT Ahtyba Rubin and rookie DE Jabaal Sheard could combine with Taylor to form one of the more dominating, young defensive lines in the NFL. The Browns appear to be establishing depth among their linebackers, although they do need to work on their tackling and pass coverage. Auston English, Titus Brown and Kaluka Maiava have done a decent job well while in the game. Maiava has started in place of expected starter OLB Chris Gocong, who has been out all preseason with a stinger. English recorded a sack in last night’s game, and Brown left the game early with a high ankle sprain. Aside from Buster Skrine, another young guy getting a lot of attention is undrafted free agent James Dockery. Dockery, who played his college ball at Oregon State, played mainly at corner last night, but could also see some action at safety throughout the season. In last night’s game, Dockery had 4 solo tackles to go along with 1 pass deflected. Dockery may be called upon to help out in the return game as well. Although Dockery muffed his only punt return opportunity, he helped tremendously in the all-important field position battle by returning 4 kicks for 96 yards – a 24-yard average. Cleveland’s two touchdowns came in the second half, when back-up QB Seneca Wallace connected with reserve TE Alex Smith. Late in the 4th Qtr, Third-string QB Jarrett Brown found WR Chris Matthews for a four-yard touchdown pass. 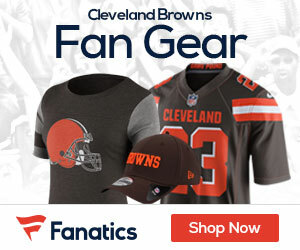 It was critical for Brown to rebound from back-to-back poor performances, as head coach Pat Shurmur stated earlier in the week that the team felt comfortable heading into the season with only two QBs on the roster. Brown finished the game completing all 4 of his passes, for 35 yards and the one touchdown pass. He also ran the ball one time for 16-yards. All-in-all it wasn’t a horrible game by the Browns, but it certainly wasn’t their best. Injuries can – and do – happen during these preseason games, and aside from LB Titus Brown, the Browns came away from the game in good health. Expect to see a majority of the second and third-string guys out there next week against the Bears. It’s an important game for a lot of those guys with roster cuts coming soon. Good pick, it seems . . . but, I hope he is the last of the “trade-downs” on draft day. We should have a top ten pick this year plus Atlanta’s No. 1. Lots of cap room, too (just like everybody else, it seems). This team needs a game-changer on both sides of the ball. This means a LB and a WR. Be nice to see that happen come April, 2012 . . . right before the end of the world and all that . . .